Mangaluru, May 05, 2018: River Phalguni’s health is as critical as it was even a year after the mass fish kill, downstream the Malavoor vented dam reported on May 17-18 last year. 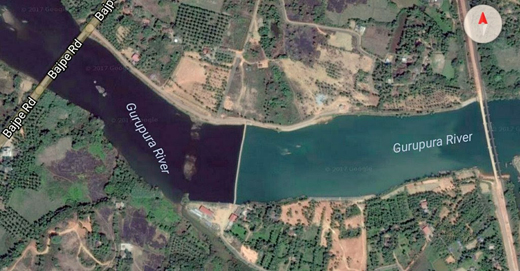 The Phalguni, popularly called the Gurupura since she flows down crossing Gurupura town, has turned blackish again downstream the vented dam, a feature which media had reported last year. In three months, the contaminated water caused mass destruction of the aqua fauna with the dissolved oxygen (DO) level falling below zero. Untreated domestic sewage of Mangaluru entering the river at many places; industrial effluents joining the river through Kudumbur stream from Baikampady; excessive sand extraction from the river bed in the coastal regulation zone etc., are likely to have enhanced the levels of river pollution. The Democratic Youth Federation of India and the National Environment Care Federation did raise their voice against the unabated pollution recently. People residing on the banks of the river had complained last year that water in wells too has got contaminated with chemical residues. Now, again the water downstream the dam appeared blackish even as a dredger deployed by the Dakshina Kannada Zilla Panchayat was pumping out soil of the coffer dam. The coffer dam, built about 200m below the vented dam to facilitate its construction, was not removed and said to have created a slush pool. Looking at the scale of dredging, it appeared impossible that the entire muck would be let loose into the river before the onset of monsoon. While the DK DC reportedly asked the ZP to remove the coffer dam in January itself, the panchayat reportedly began the work only recently. DK DC S. Sasikanth Senthil told media that the coffer dam appears to have done little in enhancing pollution levels. Reiterating his earlier stand that the vented dam should not have been constructed in the CRZ, the DC said the river could be cleansed through letting out fresh water from the dam. However, the dam is not getting any fresh water inflow. The Karnataka State Pollution Control Board’s regional office in Mangaluru has said water quality downstream Malavoor vented dam in Phalguni was better. The board’s Senior Environment Officer Rajashekar Puranik stated that the dissolved oxygen level was about 7 when measured recently while a level below 3 could spell doom to aqua fauna. KSPCB has regularly been monitoring water quality as directed by the DC, he said. Stream becomes sewage canal : The Pachchanadi Thodu (stream) has again turned out to be a sewage canal during its flow through Pachchanadi and Padushedde before joining the Phalguni upstream the Malavoor vented dam.